St. Petersburg, Hermitage Museum, inv. no. GE1131. Henri Simon Thomassin after Watteau, Coquettes qui pour voir, 1741, engraving. 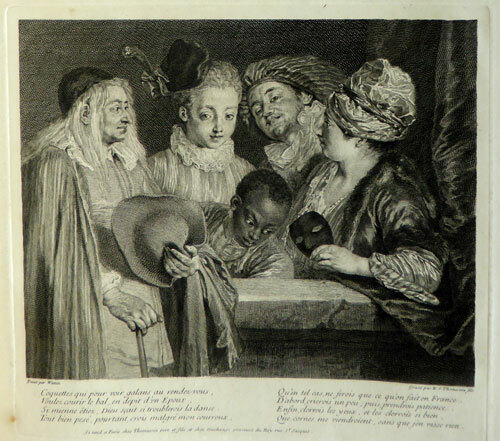 Watteau’s Coquettes qui pour voir was engraved in reverse by Henri Simon Thomassin prior to 1741. The print was cited in Bernard Lépicié’s obituary notice for Thomassin that appeared in the March 1741 issue of the Mercure de France. Francesco Bartolozzi after Watteau, A Favourite Sutana, c. 1785, engraving. The turbaned woman at the left of Thomassin‘s engraving was engraved in London in 1785 by Francesco Bartolzzi (1735-1813). 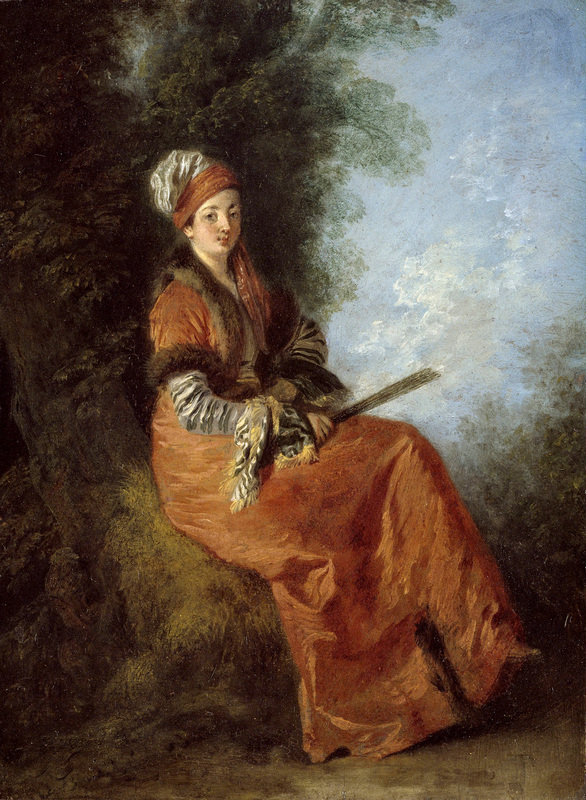 Set in an oval format, the image was captioned “A Favourite Sultana” with the misleading declaration “Watteau pinxt." Félix-Jean Gauchard after Thomassin, La Comédie Italienne, c. 1862-62, engraving. Paris, collection of Nicolas Bailly (1659-1731). According to Ernst, an old label on the reverse side of the painting specified that it came from Bailly’s collection. Zolotov et al in 1981 referred to the collector as “N. Botz” which may be an error in transcription from French to Russian. Paris, collection of Louis Antoine Crozat, baron de Thiers (1700-1770). The painting was in Crozat de Thiers' collection by 1746 according to the inventory prepared that year. It was cited in that collection by Dezallier d’ Argenville, Voyage pittoreseque, 1757, p. 140. St. Petersburg, collection of Catherine II (1729-1796; empress of Russia). Purchased with the Crozat de Thiers collection, which was bought en bloc in 1772. At the Winter Palace in St. Petersburg c. 1875; by 1912 moved to the Gatchinova Palace; transferred to the Hermitage Museum after the Russian Revolution. St. Petersburg, Starye Gody (1908), cat. 286. Moscow, Pushkin Museum, French Art of the 15th-20th Centuries (1955). Bordeaux, Musée, Chefs-d’oeuvre (1965), cat. 43 (by Watteau, Le Retour du bal [Les Coquettes ou Les Acteurs du théâtre français], lent by the Hermitage). Paris, Louvre, Chefs-d’oeuvre de la peinture française (1965-66), cat. 41 (by Watteau, Le Retour du bal [Les Coquettes], lent by the Hermitage). Leningrad, Hermitage, Watteau and his Time (1972), cat. 5. Bordeaux, Galerie des beaux-arts, Arts du théâtre (1980), cat. 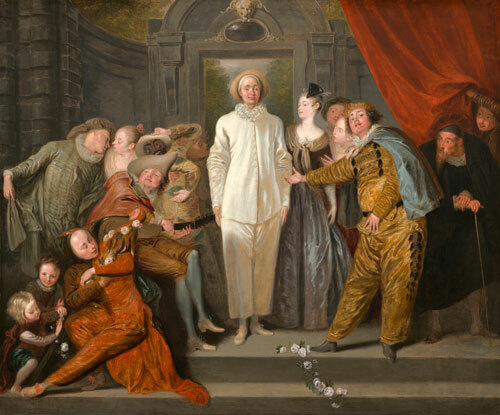 67 (by Watteau, Acteurs de la Comédie-Français, lent by the Hermitage). Washington, Paris, Berlin, Watteau 1684-1721 (1984), cat. P29 (by Watteau, Coquettes [‘Coquettes qui pour voir …’], lent by the Hermitage). Lépicié, “Lettre . . . à M. D. L. R.” (1741), 569. Mariette, “Notes manuscrites,” 9: fol. 192. Dezallier d’ Argenville, Voyage pittoreseque, 1757, p. 140. Hédouin, “Watteau” (1845), cat. 30. Hédouin, Mosaïque (1856), cat. 30. Goncourt, Catalogue raisonné (1875), cat. 78. Mollet, Watteau (1883), cat. 78. Schefer, “Les Portraits dans l’oeuvre de Watteau” (1896), 183-84. Fourcaud, “Scènes et figures théâtrales (1904) 345, 352. Weiner, Lipphardt et al, Les Anciennes écoles de peinture (1910), 114. Zimmermann, Watteau (1912), no. 122. Dacier, Vuaflart, and Hérold, Jean de Jullienne et les graveurs (1921-29), cat. 36. 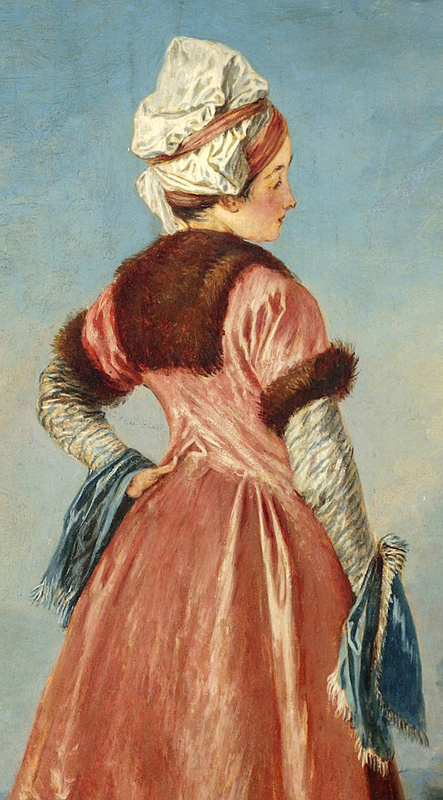 Réau, “Watteau” (1928), cat. 107. Adhémar, Watteau (1950), cat. 154. Macchia and Montagni, L’opera completa di Watteau (1968), cat. 162. Stuffmann, “Collection de Pierre Crozat” (1968) 135. Pouillon, Watteau (1969), pl. V.
Ferré, Watteau (1972), cat. B30. Nemilova, Enigmas of Old Masters (1973), 133-51. Roland Michel, Watteau (1981), cat. 118. Nemilova, La Peinture française (1982), cat. 45. Posner, Watteau (1984), 255-56, 290. Zolotov, Watteau (1985), cat 8-11. Rosenberg and Prat, Watteau, Catalogue raisonné des dessins (1996), cat. 44, 75, 135, 415, 417, 456, 608. Temperini, Watteau (2002), 79, cat. 77. Most of the five characters in Coquettes qui pour voir can be related to extant drawings, either directly or through comparable studies in Watteau’s oeuvre. Watteau, Coquettes qui pour voir (detail). 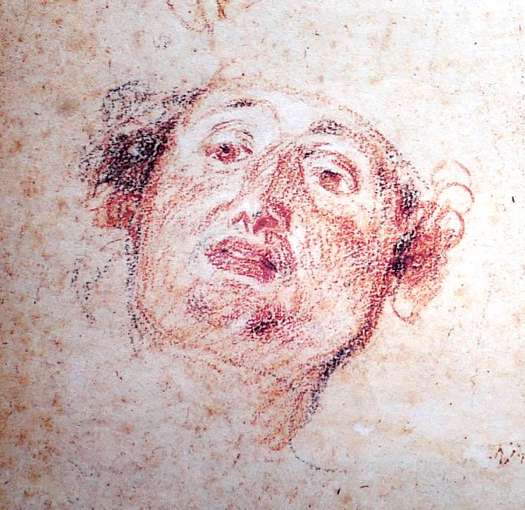 Watteau, Studies of Heads and Hands (detail), red, black, and white chalk, pastel. Paris, Musée du Louvre, Département des arts graphiques. 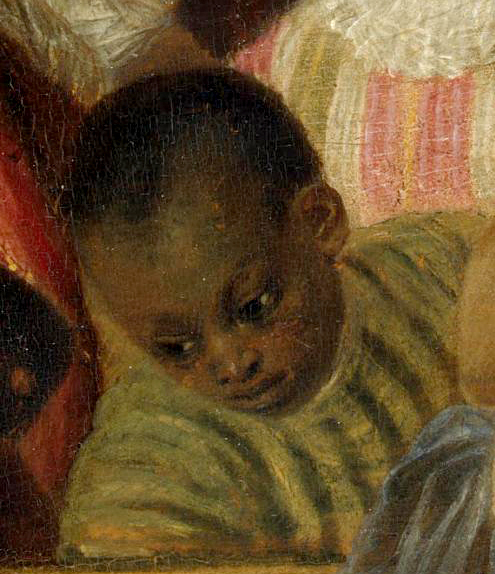 The young black man was based on a sheet of studies in the Louvre which includes three of this one figure (Rosenberg and Prat 415). The drawing shows just the head and the barest indication of his torso, and this deficiency is carried over into the painting where only the most rudimentary indications of his shoulders and torso are given. 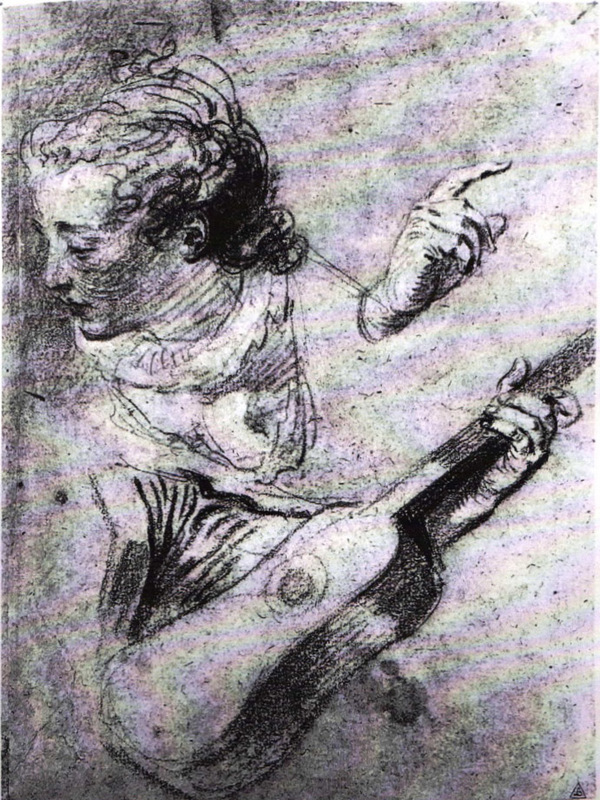 Watteau, Study of the actor La Thorillière, red chalk, 13 x 8 cm. Whereabouts unknown. Watteau, Study of a Woman in Polish Costume, red chalk, 13.3 x 7.8 cm. Paris, art market. Watteau, Three Studies of Hands (detail, here reversed), red chalk. Berlin, Staatliche Museen zu Berlin, Kupferstichkabinett. As in the preceding example, the actress at the left side of the painting has been related to an early, small, full-length study (Rosenberg and Prat 44). 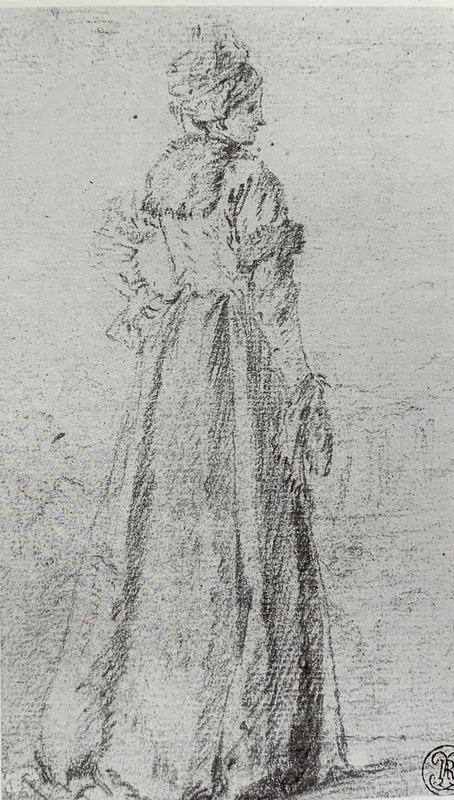 That drawings depicts a woman in the same distinctive costume: a floppy turban, as well as a short-sleeved jacket trimmed with fur around the neck, bodice, and on the sleeves. 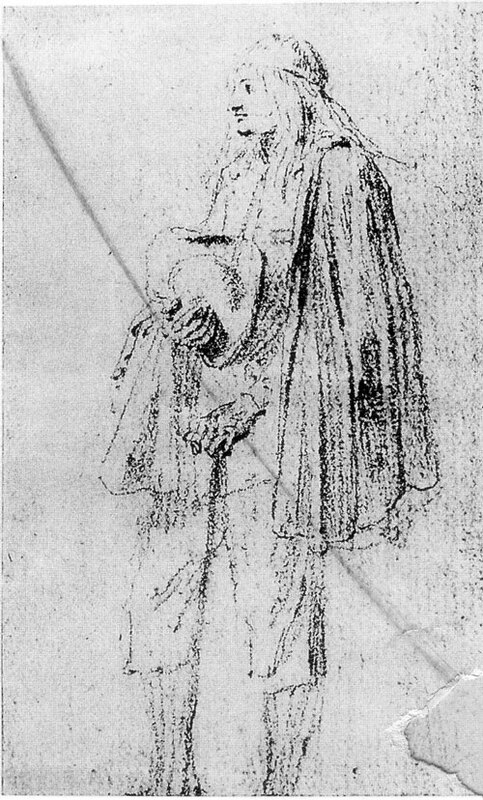 The drawing’s summary treatment of the subject makes its reasonable to presume that Watteau executed other, more detailed studies from the live model. One of these now-lost drawings would have served for his painting La Polonnaise assise, and another for Coquettes qui pour voir. Indeed, the woman in the painting is posed differently than the model in the early drawing; although the heads are set in profile in both works, the angles of the shoulders are reversed and, of course, the woman in the painting bends her arm to support her weight. 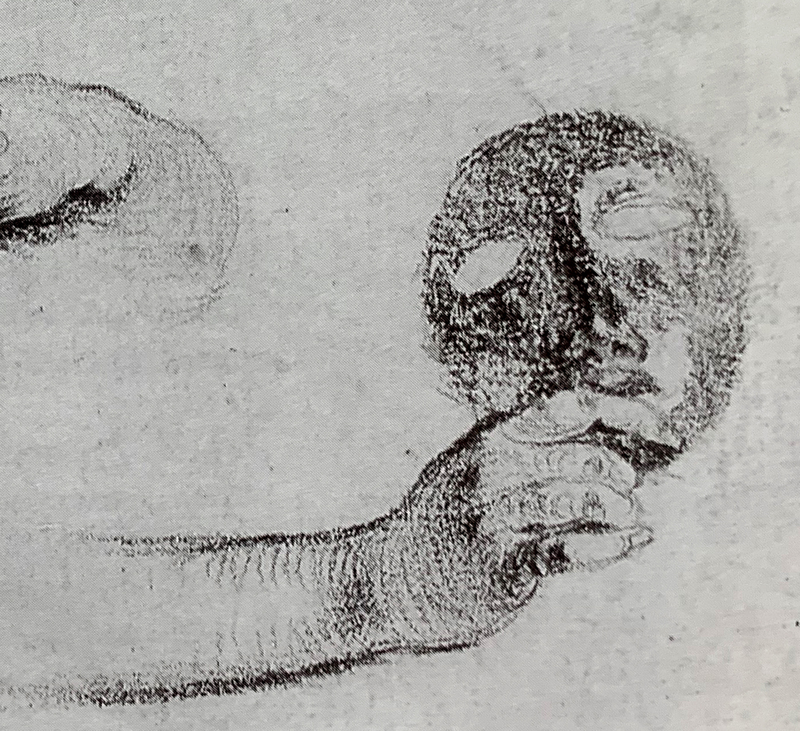 Various studies of women’s hands holding masks have been related to this painting; the closest is a study in Berlin (Rosenberg and Prat 417) but even when reversed (as Watteau could have effected with a counterproof), the attitudes of the individual fingers and the angle of the mask are not identical with the painted hand. Watteau, Studies of Heads and Hands (detail), red, black, and white chalk, graphite. New York private collection. 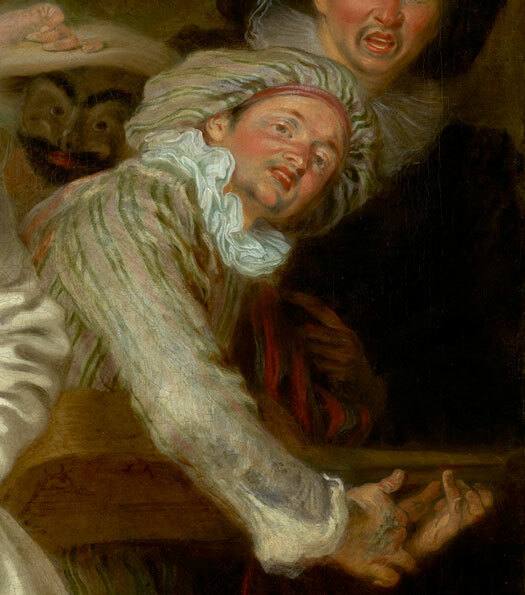 Watteau, Pierrot, Mezzetin, Scaramouche, Scapin et Arlequin (detail), Los Angeles, Getty Museum. The head of Mezzetin, thrusting out from behind the seated woman, has been associated by Zolotov with a head on a sheet of studies in New York (Rosenberg and Prat 456). 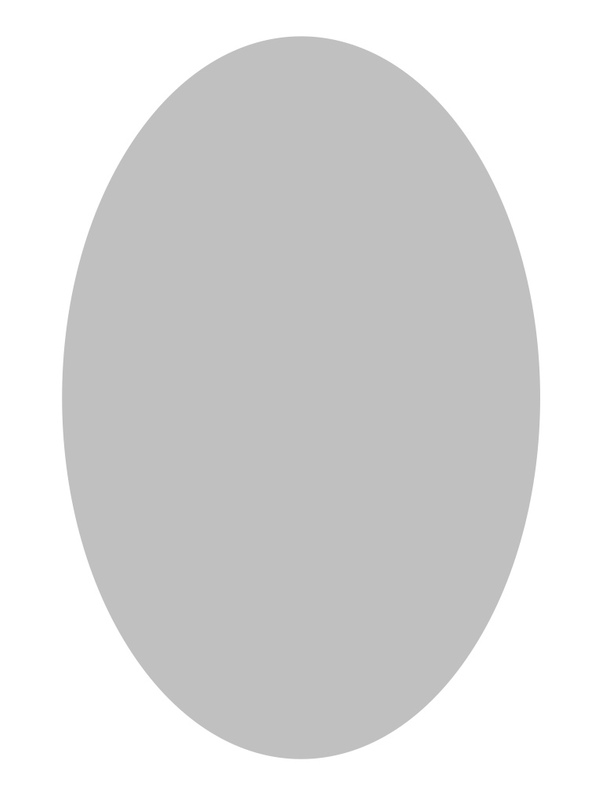 But the inclination is different, and the ear is not visible; this is not the head that appears in Coquettes qui pour voir. Rather, the drawing for this figure should be presumed lost; but something of its appearance can be deduced by the same character’s appearance in Pierrot, Mezzetin, Scaramouche, Scapin et Arlequin, now in the Getty Museum, where his upper torso and arms are also revealed, and the tilt of his head is made understandable: originally he was passionately strumming a guitar. In the eighteenth and early nineteenth centuries the titles assigned to this painting varied considerably. Lépicié called the picture Le Retour du bal, whereas d’Argenville preferred Des Personnages en masque se préparant pour le bal. Hédouin chose Le Rendez-vous du bal masqué. Beginning with Edmond de Goncourt, it has become customary to assign the painting the awkward name of Coquettes qui pour voir, the opening words of the two quatrains that appears under the Thomassin engraving. All things considered, I believe it despite my wrath. That horns would come to me, without me noticing anything. Not withstanding these three competing descriptions of the painting--going to the ball, being at the ball, or returning from the ball-- different sides of essentially the same coin, these different narratives agree that the people are not actual commedia dell’arte actors but, rather, ordinary men and women momentarily assuming those roles. Watteau, Les Comédiens italiens, oil on canvas, 63.8 x 76.2 cm. Washington, National Gallery of Art, Samuel H. Kress Collection, 1946. 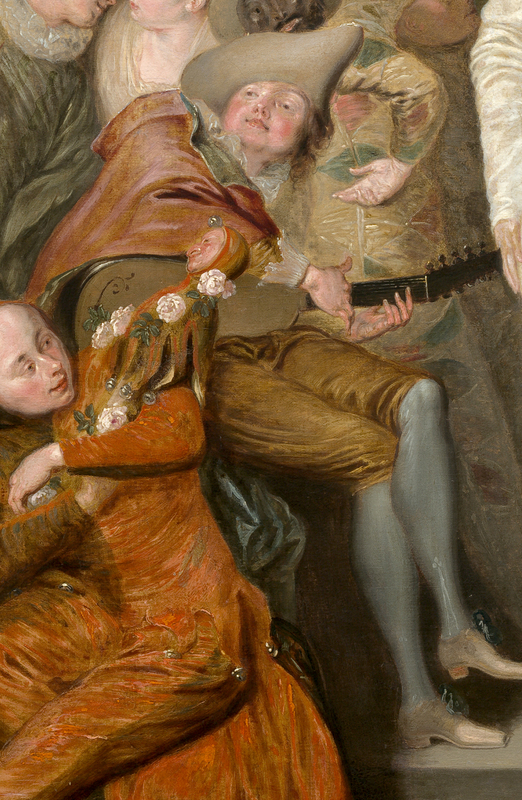 Another possibility that has been advanced is that this painting is a representation of the actors themselves and that it is like Watteau paintings such as Les Comédiens italiens. 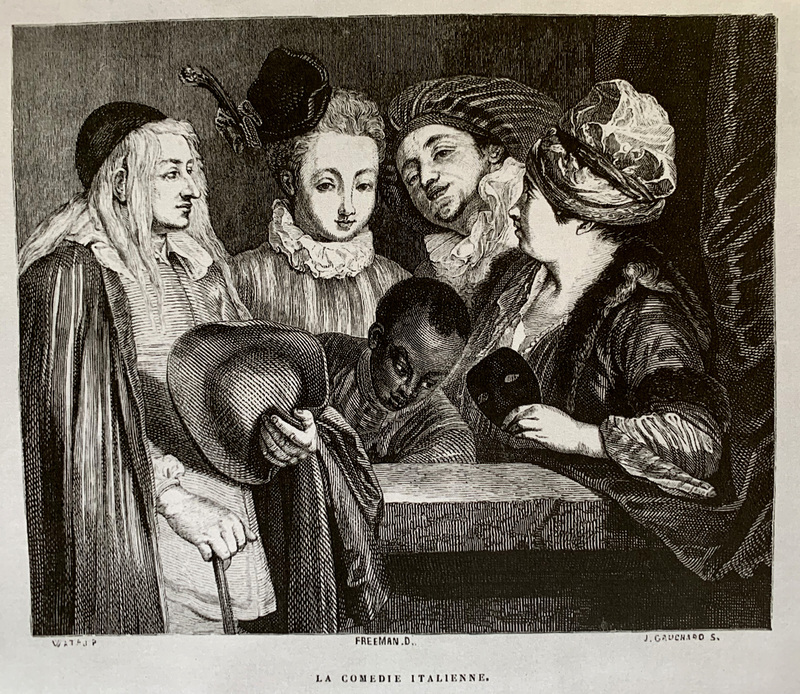 The characters in Coquettes qui pour voir strike the poses assigned to their roles: Mezzetin with his head thrown back, Cassandre hunched over his cane, the soubrette looking sweetly innocent. In several iterations of her study of the painting, Nemilova has sought to identify not only the characters but also the specific actors assuming these roles. She would have us believe, for example, that Watteau portrayed Mlle. Desmares as the soubrette. 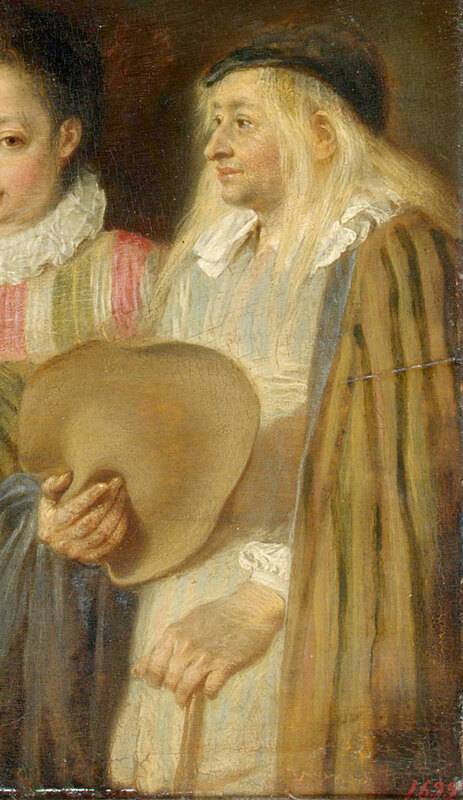 Watteau, La Polonnaise debout (detail), oil on canvas. Warsaw, National Museum. Watteau, La Reveuse, oil on canvas, 23.2 x17 cm. Chicago, The Art Institute. However, it seems unlikely that Coquettes qui pour voir should be interpreted as a representation of contemporary French theater. 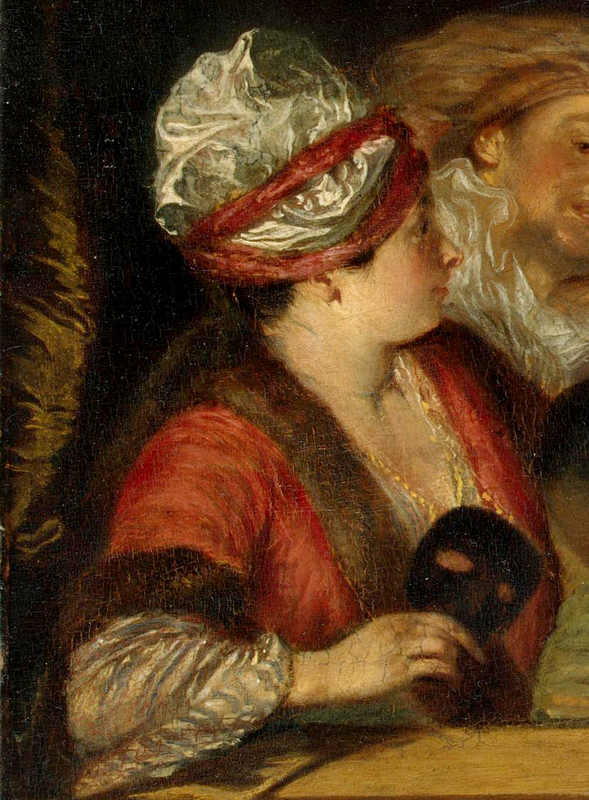 Indeed, the woman at the left side of the painting is not a standard theatrical personage. Her fur-trimmed robe and floppy turban are the distinguishing elements of what was known as the Polish costume. The same attire, probably the same woman, is seen in Watteau’s La Polonnaise debout as well as in La Polonnaise assise and La Reveuse. A mask in her hand, she is a chicly dressed Parisian prepared for a ball. 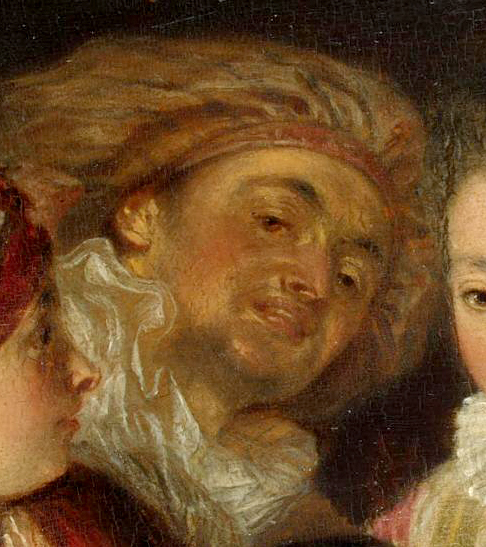 Watteau, Les Charmes de la vie (detail). London, Dulwich College. 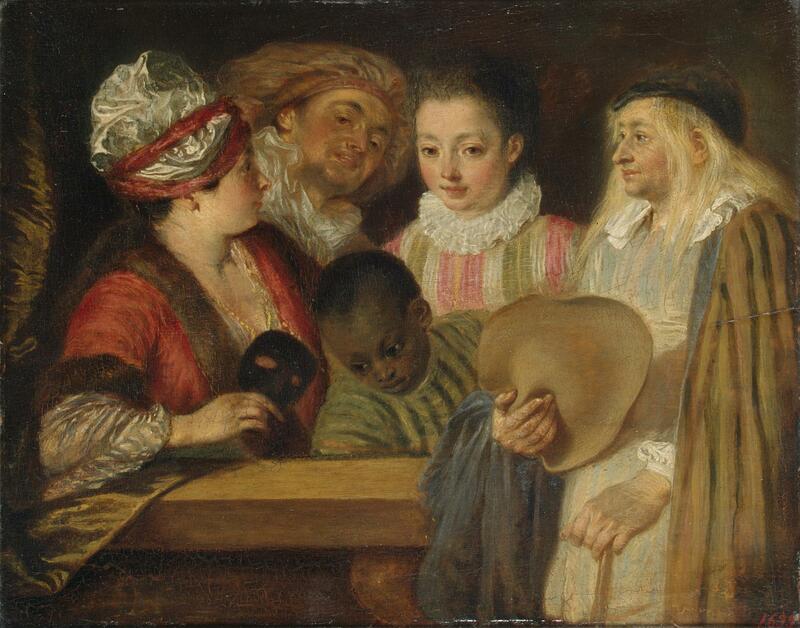 Likewise, the young black servant is not a stock character in the commedia dell’arte. Instead, he resembles the servants in several other Watteau paintings, such as Les Plasirs du bal in Dulwich and Le Concert champêtre, a portrait of the Bougi family. He especially resembles the servant in Les Charmes de la vie. 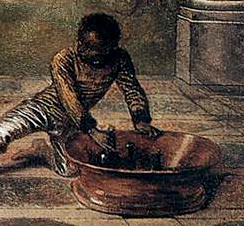 In that painting the young man's pose responds to his activity of taking charge of the wine bottles in a bucket whereas in Coquettes qui pour voir his pose seems unjustified. it seems as though he is peering intensely at the balustrade. As with so much of Watteau’s art, the subject of this painting remains ambivalent. Whether the group is going to a ball or returning from it, whether it is men and women dressed as commedia dell’arte characters or the characters themselves, such inquiries into Watteau’s intentions remain cloaked in ambiguity. The painting in the Hermitage has a well-established pedigree, having been in Crozat de Thiers’ and Catherine the Great’s collections almost since its inception. Despite losses and restorations, it is in remarkably good condition. Only occasionally has the painting’s authenticity been questioned. Nicholas Wrangl, a curator at the Hermitage in the early twentieth century (cited in Zimmerman) pointed out supposed differences between the Hermitage painting and Thomassin’s engraving: the blond actress lacks the coiffure seen in the engraving, there are differences in the actor at the right. Wrangl concluded that Mercier executed the Hermitage painting but this is baseless; Mercier could not paint at the same level of excellence and there is nothing of Mercier’s personal characteristics. More recently, Ferré, ever the iconoclast and conspiracy theorist, tried to cast doubt, questioning why Dezallier d’Argenville mentioned the painting in the Crozat de Thiers collection in the 1756 edition of his guide to Paris, but suppressed the reference in the 1765 edition. He queried why Lazare Duvaux cited a painting of “deux personages en masque, par Watteau” in the Crozat collection and Ferré quotes his colleague Saint-Paulien as opining that the Hermitage painting is a pastiche by Mercier. That opinion is impossible to accept. Just as there is essentially universal acceptance of the Hermitage picture, so too there is surprising unanimity regarding the date when the painting was executed. Almost all scholars agree that the painting is from the artist’s mid-career, but the specific year remains a matter of conjecture. Roland Michel proposed c. 1712-14 and elsewhere as not earlier than 1714-15; Mathey chose 1713-1715; Adhémar suggested 1716; Temperini proposed 1716-17; Nemilova, and Machia and Montagni preferred 1717 (although later Nemilova preferred a date closer to 1712); Rosenberg and Prat dated some of the preliminary drawings (e.g. their cat. 415) to c. 1715-16 , which would establishes a terminus post-quem. Borsch-Supan was perhaps alone to date the work as late as c. 1718.